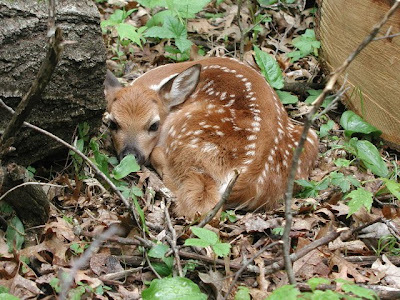 I'm starting this post off with a nice cute image of a fawn I took a few years ago because the following photos are frankly a little nasty. Consider yourself warned. Put the sandwich down. One of the things that is so much fun about being an interpretive naturalist is that you get to teach others about the fascinating goings on of nature. We get to learn a lot as we go and we're always questing for more knowledge. 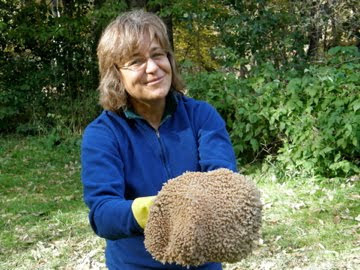 Two of my co-workers, Kathy and Bekah, have been on a real deer kick lately as they re-work part of our deer curriculum. They wanted to go into more detail with the kids about how deer have four stomachs and each is unique. You've never heard people so excited about the difference between a reticulum and an abomasum before. The four stomachs of a deer (and all ruminants) are truly bizarre and what better way to understand them than to get first-hand experience. There's nothing like experiential education. Bekah and Kathy got the stomach of a doe from a bow hunter and decided to slice it up to learn more. It reminded me of the early days of human anatomy study when scientists would go and steal corpses so they could study how bodies worked. This was far more ethical though quite possibly also more olfactorily offensive. Of course, I had to photograph everything so you could come along for the journey. Pictured above are the four stomachs all laid out as we got them. They had been on ice all weekend waiting for us on Monday when we got to work. The main chamber, the rumen, is closest to the camera. It is divided into two lobes. The other sections are considerably smaller and mostly in the upper left. We decided to slice the whole thing open and take a look inside. It is hard to really express the smell at this point. It was bad before we sliced it open. It was even worse once the chyme inside was exposed. Liberal use of a garden hose to constantly wash off the parts later in the process was only marginally helpful. I had olfactory hallucinations about this smell for a couple of days whenever I would look at these photos. There was some gagging and taking of breaks throughout this process but no one lost their lunch. Speaking of lunch, you can see the deer has been dining on acorns, corn and at this point in the year, a fair amount of grazed food such as grass. The deer haven't switched to as heavy of a browsed diet yet. I imagine it would look different at that point. I have seen deer before that were hit by cars and their stomachs were essentially full of nothing but corn. Below is most of the rumen content laid out in a pile. Deer actually have a smaller rumen than other ruminants (a cow's rumen can hold up to 50 gallons!) but this was still a massive amount of partially broken down food. Keep in mind, this pile is HALF of the rumen contents! The rumen is essentially a storage tank for the deer. They graze or browse to fill up and then retreat to a more secluded spot to process the food. The deer regurgitates food from the rumen so it can ruminate or "chew the cud." The cud is further ground up by chewing on it thus increasing the surface area. Microbes from the stomach are regurgitated as well. They become further mixed in with the food and then everything is re-swallowed. The thought of sitting around chewing on this stuff is one of the most vile things I can think of. Deer must have some of the worst breath in the animal kingdom. I honestly think drinking purified skunk scent with a hint of urine would give you better breath. Here's Bekah holding the four stomachs after they were washed out. The smell was clearly still overpowering. Incidentally, the yellow glove look is "in" this fall. The microbes in a deer's rumen help break down the food. It is interesting to note that while the deer itself does not technically "digest" much food in the rumen, the microbes do. They break down cellulose and starch into volatile fatty acids. It is estimated that deer can get as much as 40% of their energy needs by absorbing the breakdown products of the microbes though the wall of the rumen. That's pretty impressive for what is essentially a holding tank that doesn't technically do any digestion. In the photo below, Kathy is posing with half of the rumen turned inside out. You have to be pretty excited about biology to smile with a deer rumen that close to your nose. While the outside is smooth, the inside is covered with thousands of little flaps. These flaps are called papillae. The papillae greatly increase the surface area of the rumen and aid in the absorbtion of the fatty acids. I know, you want a close up photo of the papillae don't you? Don't say I never give you anything. After the rumen, the chyme moves to the reticulum. This is one of the coolest looking structures and completely unexpected when you see the reticulum from the outside. The interior surface looks like a honeycomb.. The reticulum is essentially a specialized part of the rumen that works like a strainer. Food is passed back and forth between the rumen and the reticulum. Large pieces stay in the rumen so they can be further broken down and maybe even chewed as cud while food that is small enough can pass onto the next section. Up next is the Omasum. The omasum can be thought of as a sponge. The chyme in the rumen has to have a lot of water mixed in to keep it the right consistency. The omasum removes about 65% of the water. It will mostly be replaced by stomach acid in the next section. The entire omasum is pictured below so you can see it isn't all that large. You can see all the folds to increase surface area. There are some little flaps like in the rumen as well. Some nutrients are absorbed here but that is not the primary function. It seemed to be to be rather tube shaped. Finally, we reach the last of the stomachs, the Abomasum. This section is very smooth with long folds. If we compare a deer to a human, the abomasum is the most like our stomach. I'm going to digress here and suggest anyone looking to go on a diet should simply click on this photo below to enlarge it and then bookmark the photo. Whenever you have the urge to eat simply look at this photo and you'll lose all desire to eat. All the previous steps are complex food processors getting it all ready for the abomasum. Here, acids help break down fats, carbohydrates, and proteins and the food so they can be absorbed. Another completely fascinating thing that happens here involves the microbes that were busy breaking down food in the rumen. Some of them invariably get passed into the abomasum along with the food. They die instantly from the acid. The deer can then absorb the nutrients from the microbe bodies. It is estimated that deer receive as much as 90% of the amino acids they need by digesting the microbes! When we were done examining the stomachs we saved some samples to embed in a clear plastic resin so we can teach kids about them without the stench. Lucky for the kids, the stomach parts don't smell once encased in plastic. That was really interesting. Thanks for brving the stench for science! A calf stomach contains rennet which is used to make cheese. The rennet is a complex of enzymes, primarily chymosin. I'm assuming the name comes from the fact that it resides in the chyme i.e. partially digested food. The enzymes break down milk in the stomach into curds and whey so they can be digested. In cheese making, rennet is used to break the milk into curds and whey as well. The curds were traditionally what was made into cheese though there are some uses for the whey as well. Douglas Chadwick in his wonderful book entitled "A Beast the Color of Winter," discusses rumination in mountain goats. One of the byproducts of this form of digestion, he points out, is the "heat of fermentation." He suggests that while we are hopping around flailing our arms to stay warm in bitterly cold weather, mountain goats, wrapped in their heavy winter coats and with an internal furnace (rumen) grumbling away, are quite comfortable bedded down chewing their cuds. I presume deer also enjoy this source of heat when winter winds come roaring out of the north and temperatures plummet. Did any of you run across any reference to this in your research? I hadn't heard that Gordon. I did some searching and I found references to deer doing the same thing. Maybe we can teach about that as well. This may top their fur as one of the more interesting ways to stay warm. Deer fur is fascinating as it is hollow and is a very efficient insulator as the warm air cannot be blown out of it by the wind. Absolutely fascinating! Great photos and very clear narrative -- answered lots of questions I'd had over the years. Thanks for taking the time to explore and share with us. There is subtle beauty in the patterns and shapes of the stomach linings. Well, I will admit to being simultaneously disgusted and fascinated. Truly, though, this was very educational, and my hats are off to all of you for delving into this subject. Have any of you ever brain-tanned a deer hide? I've only heard about it, but it seems like a natural thing to try for those girls who are on a "deer kick" right now. Sarah: Thanks. It really was interesting inside. The honeycomb in the reticulum especially. Heather: None of us have tried brain tanning. Our old director was thinking about it at one point. Maybe some day. You can be sure I'll post photos if we ever do it!